Other officials said that the hotel was believed to be full of guests; it generally hosts mostly visiting Afghan government employees and official guests, and is often full. Shahzad Aryobee, the Minister of Telecommunications, said that 105 employees of his agency were among those inside the hotel. A view of the Intercontinental Hotel in Kabul in 2016. The hotel was attacked in 2011 in a similar incident. Mr. Aryobee was talking by phone to several of his trapped staff members, who said there was a feeling of desperation in the hotel, with reports that some colleagues had been jumping out of windows. 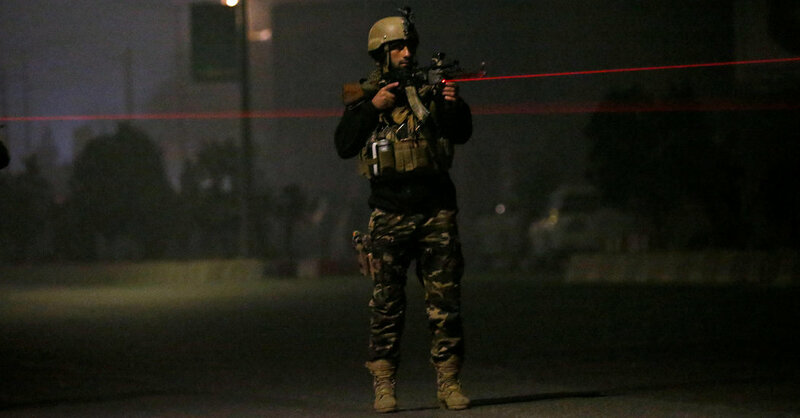 Haji Saheb Nazar, 45, an employee of Afghan Telecom, who was in the hotel for an agencywide meeting, said he was still hearing shooting even after 2 a.m. in Kabul, five hours after the attack began. Like other guests, he said, he was pinned down in his room, afraid to leave it. Abdul Rauf, 48, from Ghor, another trapped guest, said he ran through the halls of the hotel as an armed man was firing. “I don’t know if he was the police or a suicide attacker, but he was shooting,” he said. “I escaped to my room and locked the door. I heard shooting and more than three explosions. Two rooms were on fire and smoke came into my room. I couldn’t breathe until I broke a window with my chair, “ Mr. Rauf said, speaking by cellphone from the hotel while hiding under his bed in his room. This is not the first time that the popular hotel has been the target of an attack. The Intercontinental Hotel was attacked by insurgents in 2011; 21 people were killed, including nine assailants, and many others wounded before the Afghan authorities, with substantial assistance from international military forces, managed to bring the attack to an end. Wahid Majrooh, a spokesman for the Ministry of Health, said that ambulances were at the scene but that so far none had been able to reach the immediate hotel compound, which is on top of a steep hill. The hotel was once part of the chain of Intercontinental Hotels, but is now government owned. Hours after he had arrived, Mr. Aryobee was still outside the hotel, fielding frantic calls from trapped staff inside. “Some of them got out, but the majority of them are still in the hotel,” he said.